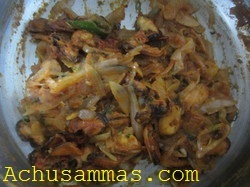 Green chillies – 2-3 nos. · Sauté for a second and add the drained rice. · Stir fry the rice till it turns opaque and add water, mint leaf, salt and cook the rice till it is cooked and keep it aside. · Clean the mussel and drain all water. · Marinate it with chilly powder, turmeric powder, pepper powder and salt. Keep it aside for 10-20 minutes. 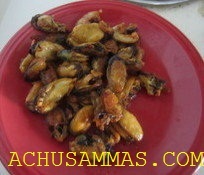 · Shallow fry mussels till golden brown, but don’t fry till crispy. Keep it aside. 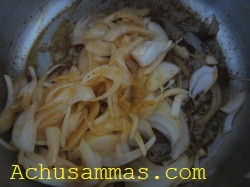 · In the same pan (used for frying mussels) add the sliced onion. Stir fry till become golden brown at medium heat. · Grind the ginger, garlic, fennel seed, green chilly into coarsely paste without adding water. · Add turmeric powder, chilly powder, coriander powder,garam masala. Stir for a while. · Add the fried mussels and mix it well. 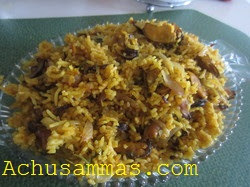 · Finally add the cooked rice into the above mussel masala and mix well close the lid and cook for 5-10 minutes on simmer heat. · Garnish with fried onion. Have it with cucumber raita….. 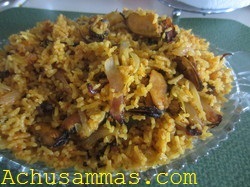 Very delicious biriyani..never had this before,looks flavorful!! Mmmmm, I love mussels, and this looks fabulous!! 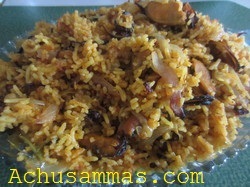 Biryani looks flavorful and delicious..